Attention Weekend Research Warriors! ProQuest will be taking down their site for product maintenance this weekend. This will affect our access of their database Saturday night beginning at 9pm until Sunday morning at about 5am. Of course these times may vary slightly as with any database maintenance. Hopefully the upgrades will run smoothly and we will be up and running for our Sunday warriors. To maintain the currency and security of ProQuest products, we are performing maintenance on many ProQuest products beginning on August 18, 2018 U.S. Eastern Time. We would like to add our apologies, as well, and hope that your research efforts will not be adversely impacted. We have added full support of Read by QxMD so you will now be able to link directly from article abstracts to the full-text of the article if the Library has a subscription. 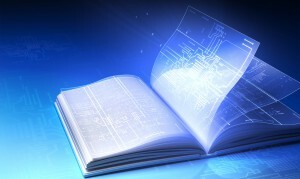 You can access Read by QxMD on your computer by going to https://www.readbyqxmd.com/. Mobile apps are available through the appropriate Android and Apple app stores. You will need to create an account in order to link to our journals. 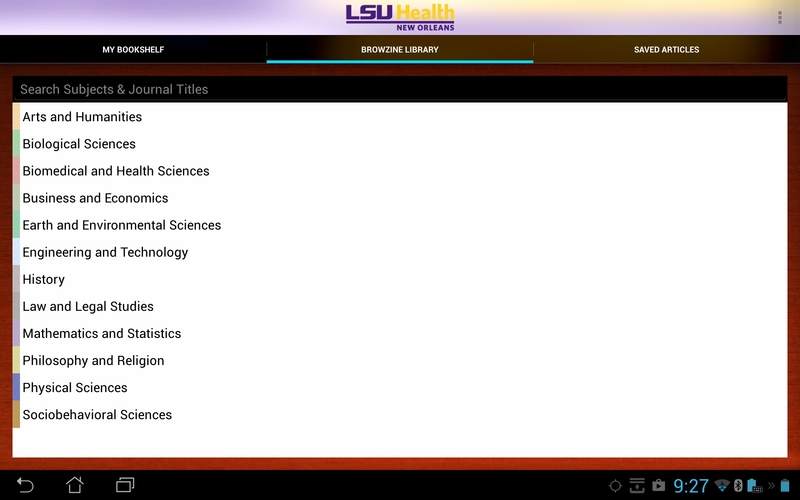 When you are setting up your account, be sure to choose “Louisiana State University Health Sciences Center New Orleans” as your home institution. You can then choose whether you would like to be prompted to log in each time you need to retrieve an article, or to have your credentials automatically sent. If you choose the automatic login option, you will need to enter your Library barcode and PIN. We hope this new addition will make your journal browsing easier and more robust, but if you have any questions please contact us. The Wiley Online Library will be down for a few hours this weekend. According to a message on their website, Wiley Online Library will be unavailable on Saturday, July 1st, from 2:00AM-8:00AM CDT and on Sunday, July 2nd, 2:00AM-5:00AM CDT for essential maintenance. We would like to join the fine folks at Wiley in extending our apologies for the inconvenience to our dedicated researchers burning the midnight oil. If you use BrowZine, you might have come across times when you wanted an issue from a year earlier than currently listed, were looking for a journal that was not included, or needed an article where the full-text was not available. 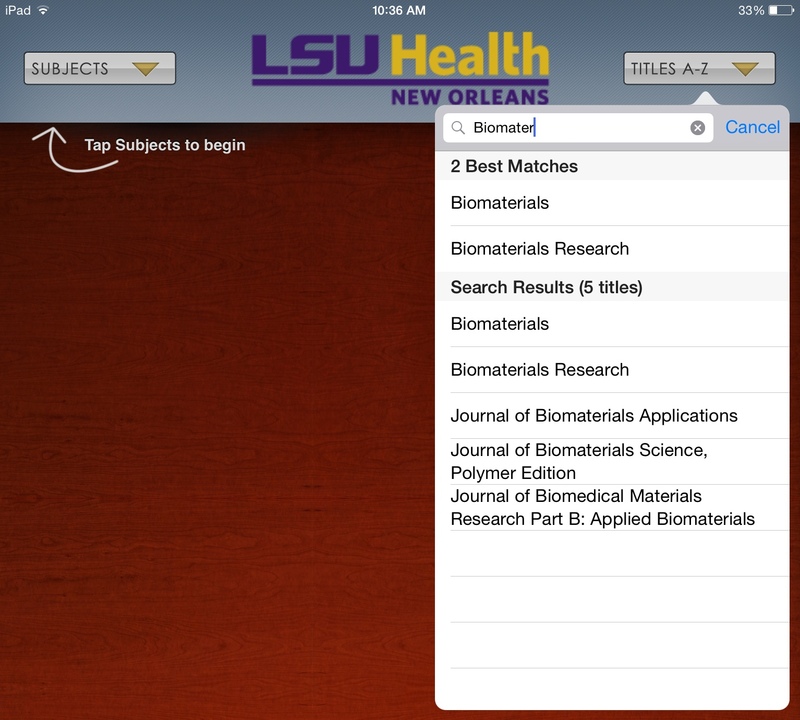 We are happy to report that recent enhancements have supplemented your ability to browse more journals and articles. This will bring you to a search of the E-Books & E-Journals A to Z List and shows any additional years and sources the Library has for the full-text of that journal. Finally, a third new feature for the Library’s BrowZine will work in both the web and mobile versions. 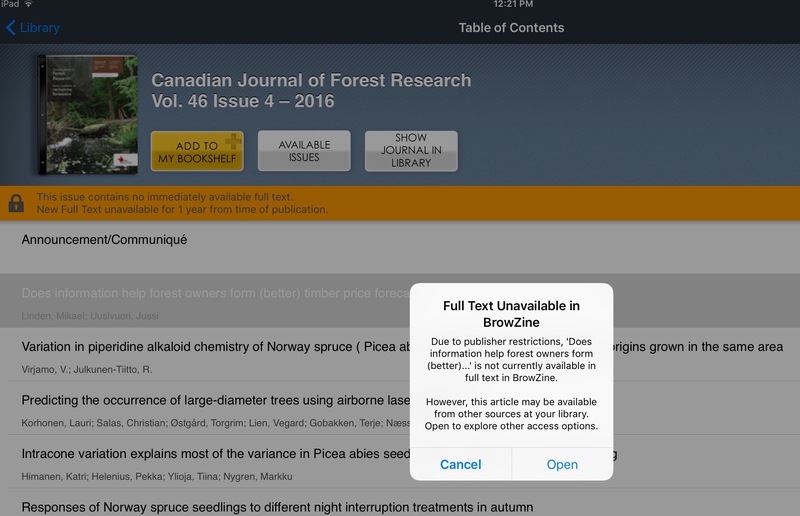 When you come across an article that might not be available due to restrictions that delay the availability of that article from the source BrowZine uses for the journal, you can now check the Library’s WebBridge Link Resolver for any other places where the full-text is currently available. Hopefully these new features will help you when you’re using BrowZine, but if you need any assistance please do not hesitate to contact us. 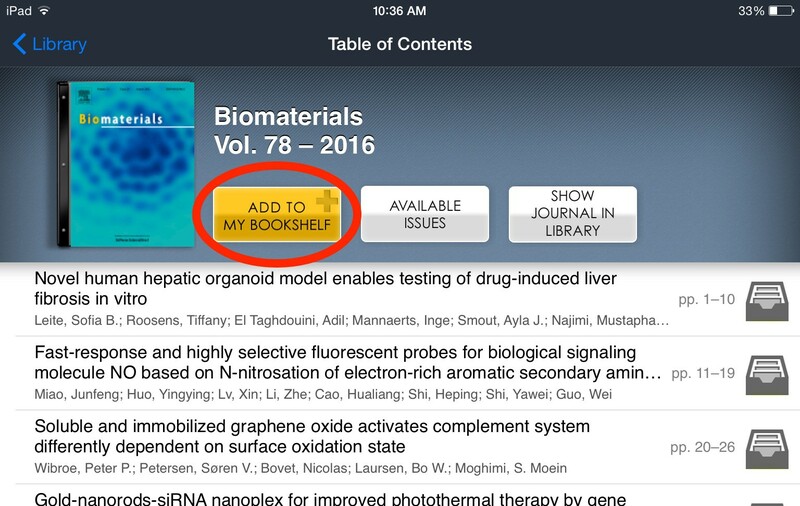 While giving you easy access to your favorite journals, the BrowZine app also lets you customize a bookshelf to get to these publications quickly. 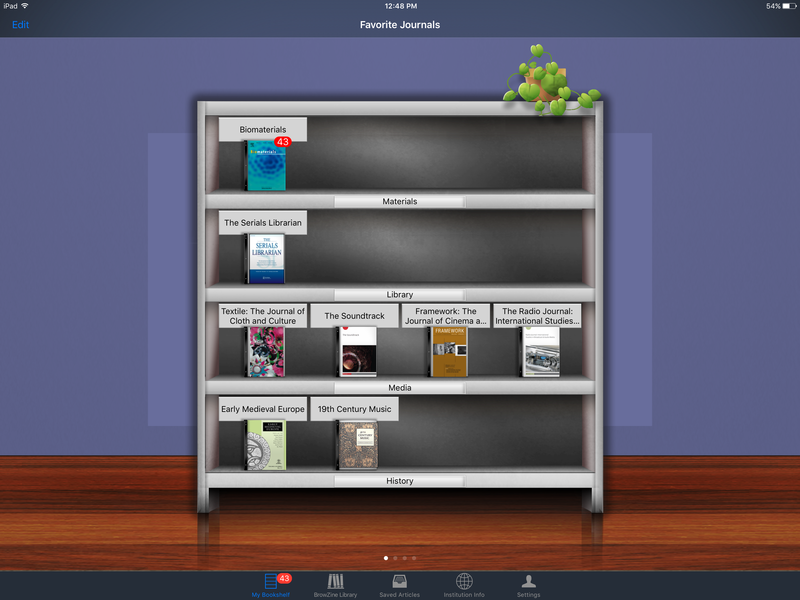 Removing items from the Bookshelf can also be done when viewing the journal; the commands to remove items replace those that were used to add the title initially. 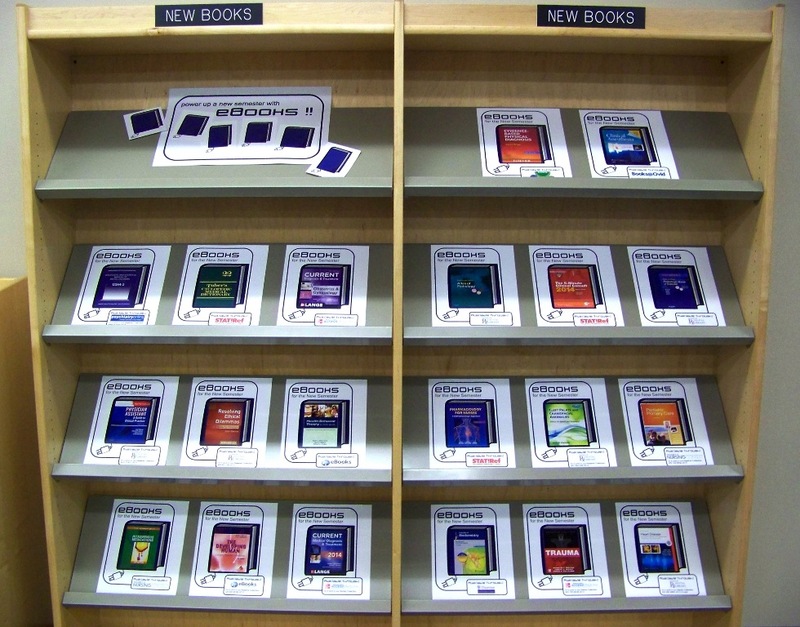 At present you are unable to sync your web and app BrowZine Bookshelf, but that enhancement is coming soon. If you need more information about BrowZine, check out our LibGuide. 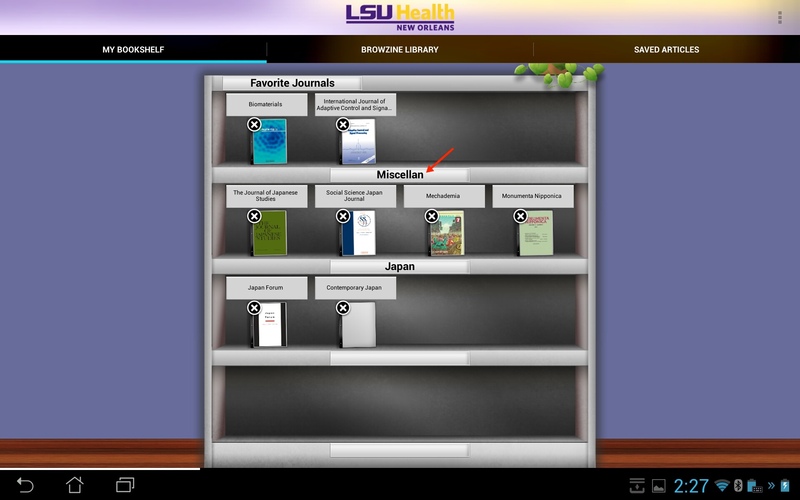 If you’d like to keep current with your favorite journals or subjects, BrowZine is there to help you. Although you can use the web version, they also have apps available for Android and iOS devices so you can take your journals with you wherever you go. You can download the app from the Amazon AppStore, Apple App Store, or Google Play from this page. More information about off-campus access to Library resources as well as how to register for an account is available here. 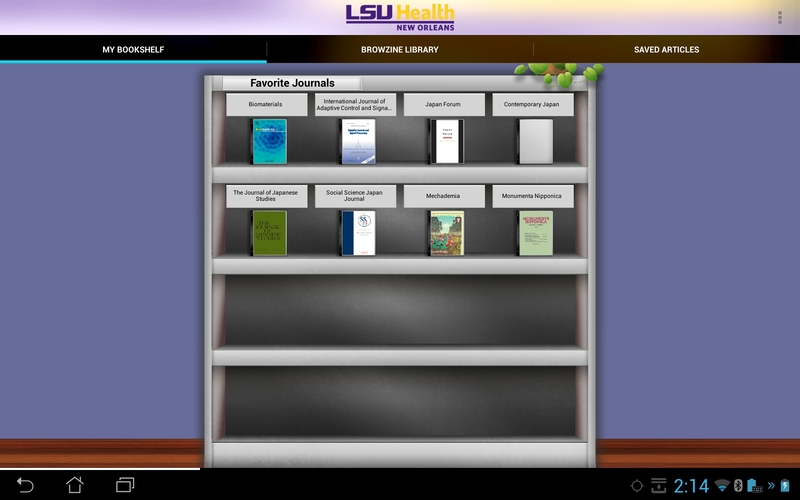 Once you’ve set all of these up, you’re ready to start browsing or searching for your favorite journals. There are slight differences in how to do this in the apps for Android and iOS. 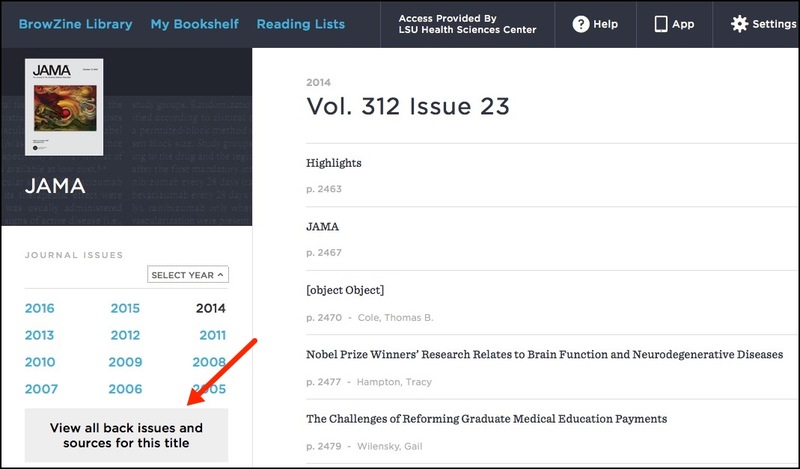 You can now choose to view any journals that pique your interest. This should get you up and running with the BrowZine app, but stay tuned for more tips about how to use other features. If you need any help with BrowZine or any other Library services, do not hesitate to contact us. The Library is pleased to announce that we now have The Medical Letter on Drugs and Therapeutics online. The Medical Letter, Inc. is a non-profit organization whose goal is to provide unbiased drug information. The Medical Letter does not accept advertising, grants, or donations from any outside source, and it is solely supported by subscription fees. The Medical Letter on Drugs and Therapeutics was first published in 1959. The online collection begins in 1988 with v.30. The Library’s print collection includes v.1 (1959) – v.56 (2014). The Medical Letter includes peer-reviewed, evidence-based drug information, CMEs, and 2 ebooks: Handbook of Antimicrobial Therapy and Drugs for Parasitic Infections. Access is available on campus, as well as off campus by logging in through the Library’s remote access proxy, WAM. There is also an app available from Apple’s App Store, Google Play, and Amazon’s App Store for Android after registering on the Medical Letter’s web site. The Medical Letter has generously donated access for our university at no charge for one year. If you miss the days of scanning through the displays of recently-received journals, the Libraries are proud to now offer access to BrowZine. 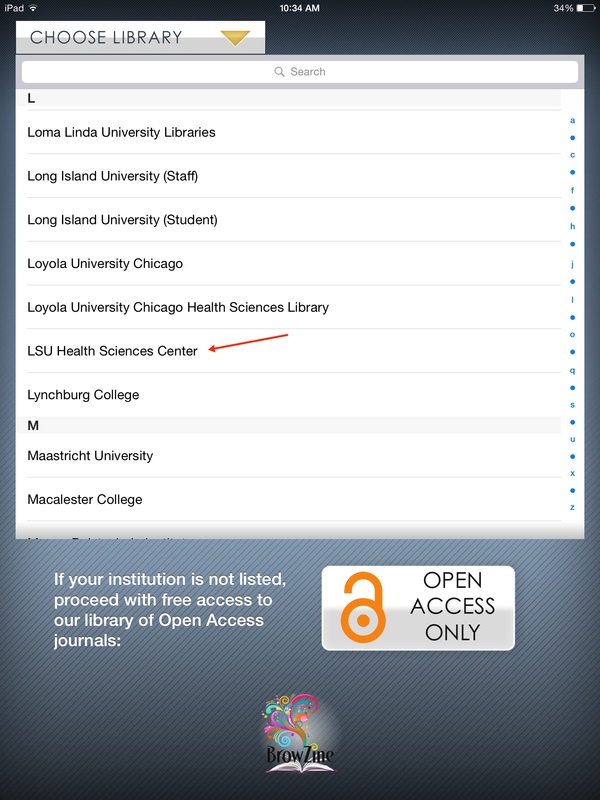 From the comfort of your web browser or mobile device, you can thumb through your favorite journals or see what’s been recently published in a particular subject area. Most publishers are represented in the service, making this a great way to stay on top of many topics and journals. 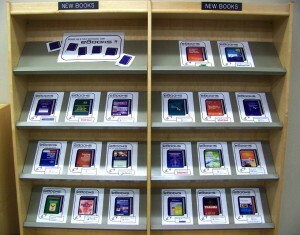 The Libraries’ web version of BrowZine can be accessed through this site. You can also download the mobile version for Android, iOS, and Kindle Fire HD tablets by starting here. More information can also be found on the Libraries’ BrowZine LibGuide. Look for more tips and tricks about BrowZine in the coming weeks! Start the new academic year by learning how technology can help make your life easier. The Library Lunchtime Learning program will be coming to the downtown campus for a Hands-on Technology Expo on July 21. We’ll be rounding up some of your favorite gadgets, demonstrating how to access library resources from your mobile device, and talking about education apps. Bring your own tech tool too! If you plan to attend, please RSVP to rpremo@lsuhsc.edu. However, we welcome drop-ins. And if you can’t make it, send an e-mail and we’ll send the handouts to you. 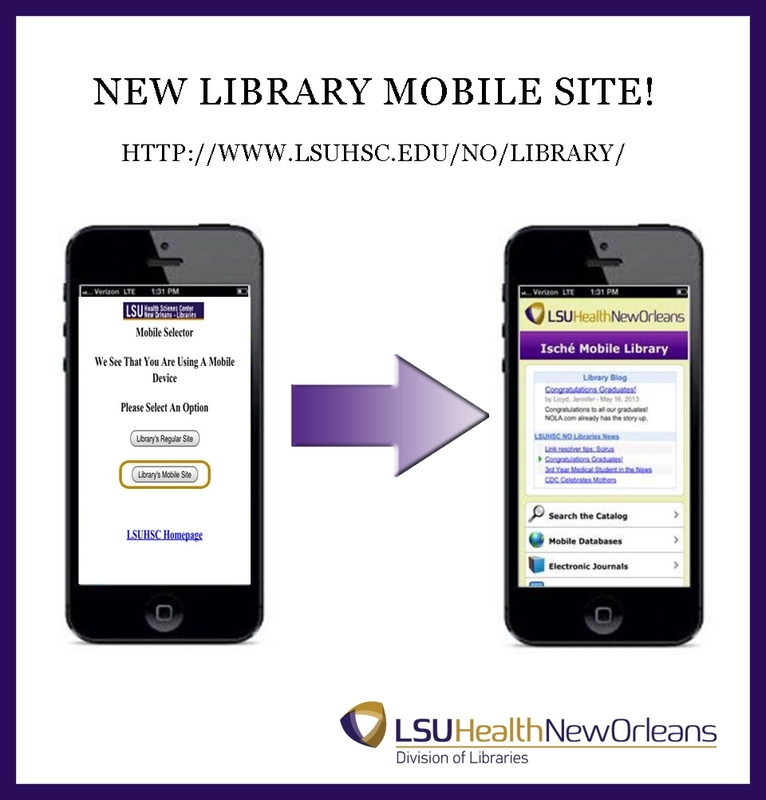 Faculty News, Library News, Mobile Resources, Tools | Permalink | Comments Off on Technology Learning @ the Library | Posted Friday, July 11, 2014 by Premo, Rita L.
This week, LSU Health Sciences Center introduced an emergency reporting service that will allow faculty, staff, and students to send text messages to University Police in order to facilitate the reporting of crime, to help prevent crime, and to allow police faster and more accurate information. Subscription and registration with campus emergency alerts is not necessary. 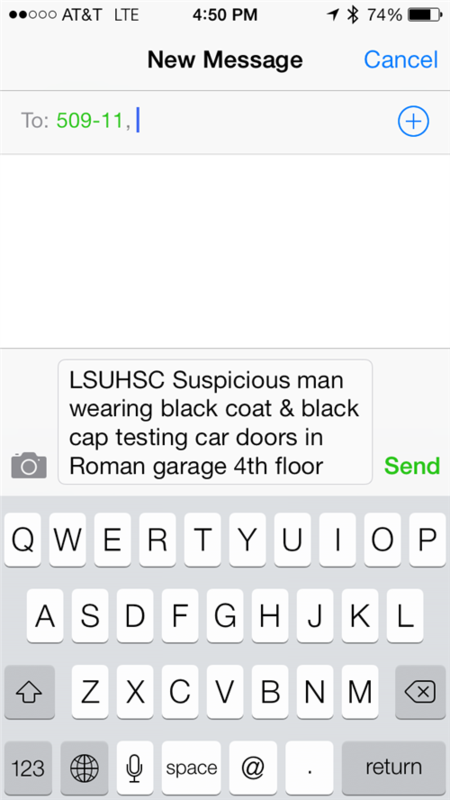 Users can simply send a message to 50911 with a text beginning “LSUHSC” in order to notify University Police of emergencies, crimes, and suspicious activities or persons in the area. Normal text message rates assigned by cell phone providers will apply. 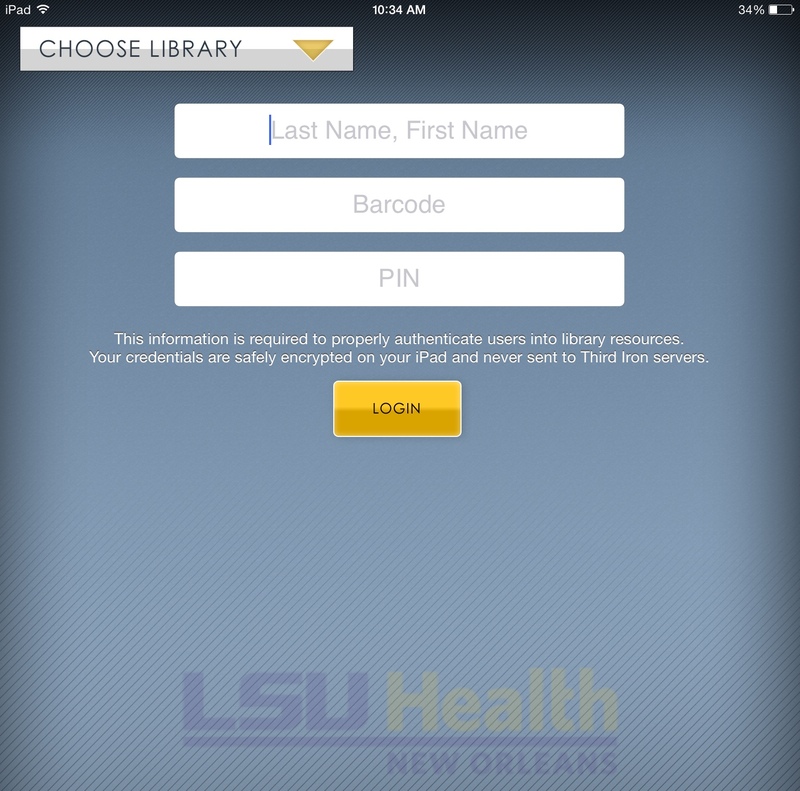 Users may also contact University Police with non-emergency information at 568-8270 or via online message at http://www.is.lsuhsc.edu/police/response.htm. 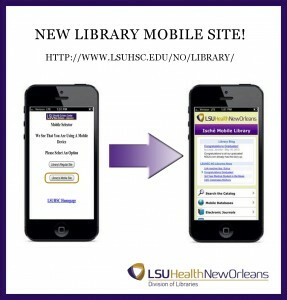 The graphic below provides more detailed information about this service from http://www.lsuhsc.edu/alerts/utip.aspx. Campus News, Faculty News, Mobile Resources, Student News | Permalink | Comments Off on uTip: Text Emergency Alert System | Posted Wednesday, March 12, 2014 by Phillips, Holland T.
The Library is currently showcasing twenty new eBook titles that are available through nine of our subscription collections. Library users also have the option of linking directly to the individual items at the New Books display shelves when visiting the Library, by scanning QR codes with their mobile device (code reader app required). The shelves are located in the Reference area (near the Library elevator), on the third floor of the Resource Center Building. 1. Barash, Paul G. Clinical Anesthesia (also: Ische Reserve, WO 200 B23c 2013). 2. 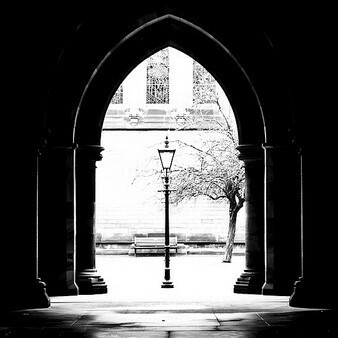 DiClemente, Ralph J. Health Behavior Theory for Public Health. 3. Moore, Keith L. The Developing Human: clinically oriented embryology (also: Ische Reserve, QS 604 M78d 2013). 4. Current Medical Diagnosis & Treatment 2013. 5. DeCherney, Alan H. Current Diagnosis & Treatment: obstetrics & gynecology. 6. Mattox, Kenneth L. Trauma [AccessSurgery] (also: Ische Stacks, WO 700 M436 2013). 7. Burns, Catherine E. Pediatric Primary Care (also: Ische Reserve, WS 100 B93p 2013). 8. Gahart, Betty L. Intravenous Medications: a handbook for nurses & allied health professionals. 9. Diagnostic & Statistical Manual of Mental Disorders: DSM-5 (also: Ische Reserve, WM 15 Am3 2013). 10. Allen, Hugh D. Moss & Adams’ Heart Disease in Infants, Children, & Adolescents (also: Ische Stacks, WS 290 M85h 2013?á v1-2). 11. Klatt, Edward C. Robbins & Cotran Atlas of Pathology. 12. Kummer, Ann W. Cleft Palate & Craniofacial Anomalies: effects on speech & resonance (also: Ische Reserve, WV 440 K96 2014). 13. Lo, Bernard. Resolving Ethical Dilemmas: a guide for clinicians (also: Ische Reserve, WB 60 L78r 2013). 14. Mitchell, Richard N. Pocket Companion to Robbins & Cotran Pathologic Basis of Disease. 15. Physician Assistant: a guide to clinical practice (also: Ische Reserve, W 21.5 B21 2013). 16. McGee, Steven R. Evidence-Based Physical Diagnosis. 17. Adams, Michael. Pharmacology for Nurses: a pathophysiologic approach. 18. Domino, Frank. The 5-Minute Clinical Consult 2014. 19. Taber’s Cyclopedic Medical Dictionary. 20. Koolman, Jan. Color Atlas of Biochemistry.